It was about 3:45 pm and I was running late getting out to the woods on December 7th, 2009. I remember trying to figure out if I wanted to hunt on the east side of the road or west. As I approached the property in Van Buren where I hunt, I saw a harvester on the west side of the road in an adjacent field. That made up my mind. I hoped it would push something to the property that I hunted, so to the west side I went. I was on the tip of a wooded peninsula so I could watch the back field and the front field. As I was passing the time watching the harvester leave the field for another load of manure, I saw a deer run across the field behind the harvester. I then decided to take a chance and move closer to the back field and maybe I could see it or something would come out in my field. I began walking along the edge of the woods so they were to my right and the field to my left. As I raised my Thompson Center pro hunter 50-caliber muzzleloader with a Nikon omega scope sited in at 100 yards I heard a noise in the woods again. I turned to see a squirrel running by. “Damn it! Now I need to focus on the biggest doe,” I thought to myself as I turned my head to see a third deer trotting after them. Then I saw ivory. Still not knowing how big he was, I decided to focus on the buck. He was moving at a good trot, chasing the two doe. I took my time telling myself to relax, and then I took aim. The gun was moving a little but I didn’t have much time, so I stuck my elbow into my side and held my breath. Bang! I took a 94-yard shot (I went back on December 9th to verify the range with my range finder). As the smoke was clearing I saw him fall. I quickly reloaded and waited to see if the two doe would come back. I couldn’t wait very long because I wanted to see what size the buck was. I walked slowly, ready for another shot if needed. As I approached the buck laying in the corn lot I saw a big rack, but I told myself, “I need to focus and make sure he’s dead first.” I touched him with the end of my barrel and nothing. I took off my jacket and set my gun on it. I walked over to his head and picked it up. “Oh my God! Is this really mine? Thank you Lord!” I then took a few pictures and texted a few friends to tell them the news. I tried to count the points, but I forgot how to count. Finally about the fourth try I came up with 18 points. I called a buddy of mine, Dave Blaisdell. I said, “Dave, can you help me get a deer out of the field?” He responded, “Man, I was just over that way, but yes.” I said, “Get in my truck and come across the fields to the back lot.” He asked what I had got and if I had seen a buck. I told him that I saw three deer and I had a big doe down. I could not get a shot at the buck. About 10 minutes later, he arrived, driving my truck through the fields. As the headlights came upon me I picked up the head of the deer and Dave started blowing the horn and driving faster. I thought he was going to run us over. He jumped out of the truck and yelled, “Smiley!” and gave me a manly hug. As I field dressed the deer, Dave was on the phone calling everyone. We loaded the deer onto the back of the truck and showed him off for a few hours that evening. That’s the story of my biggest buck of a lifetime. 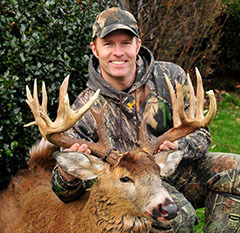 I took the buck to Dallas Sumner of Baldwinsville to have him score the buck on December 9, 2009. The Green final score is 178 5/8 the gross score is 185 7/8. 13 points on right side 6 on the left side totaling 19 points. Dallas also showed me the whitetail record book of New York State 14th edition. According to my Green score it would fall second in the muzzleloader non typical for New York State. The weight of the buck is 155 lbs. While I was at Pathfinders Rod and Gun Club getting it scored a few guys tried to look at the bottom jaw to see how old he might be. As of now they seem to think 4 ½ or5 ½ years old. I should have the age on December 11, 2009 from the taxidermist. The final score of the buck is 18 points 177 1/8. It now ranks 4th in NYS for non typical. The age is 5 1/2 years.